This workshop includes classroom instruction, followed by a morning photo excursion to photographs birds of prey at West Coast Falconry. Your final session will conclude with a gallery exhibition and critique. An all-inclusive hands-on workshop for every level of photographer with Touch & Try of Tamron Lenses! Workshop includes an evening of classroom instruction at Mike's Camera, followed by a Saturday morning photo excursion with birds of prey at West Coast Falconry in Marysville, complete with Tamron lens rentals, and then a follow up critique & in-store gallery opening. Tuition includes evening lecture, hands-on photo excursion with Tamron lens rentals, follow up critique & gallery showing, plus a matted 12 x 18 inch print that will be displayed in the store gallery and is yours to keep! See your favorite image enlarged to 12 x 18 inches in our mini in-store gallery too! Part 1: Making portraits of birds while they are static in the trees. Topics include light, composition, exposure and depth of field. Part 2: Photographing birds in mid-flight. Topics include shutter speed, panning with action, auto focusing modes, focusing tips and more. Meet up at West Coast Falconry in Marysville to photograph an assortment of birds of prey. You'll have the rare experience to photograph all of the birds in their natural habitat. 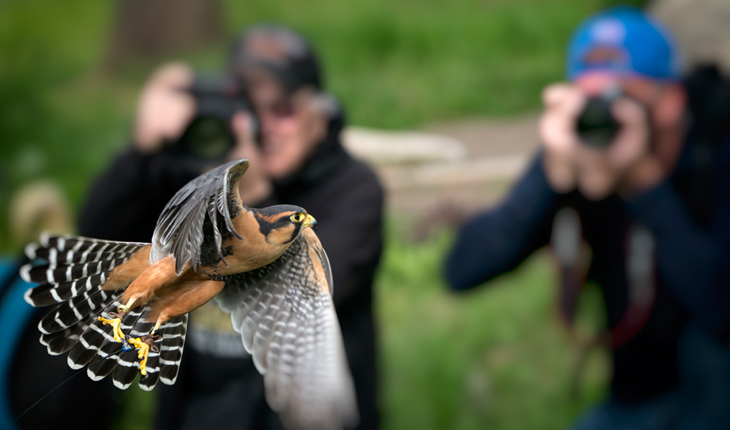 Enjoy a close-up, hands-on bird photography experience! During the shoot you'll be able to try out the latest Tamron lenses, for FREE! Test a variety of long zoom lenses perfect for photographing wildlife, and get expert advice from Tamron wildlife shooters. A valid Credit Card & Driver's License is required for equipment check-out and will be kept on file until return of equipment. Test Drive Loaner gear is FREE. Restrictions apply. Meet back up at Mike's Camera in Sacramento to wrap up the workshop with a fun and rewarding critique or your photographs! The group will review images from the Saturday excursion and share techniques that really worked, and those that were not as useful. You'll be astonished by the immense variety of images that will have been captured and spend some time giving and receiving positive and informative feedback.